2016 was a whirlwind of a year, and we are so excited to see what 2017 will bring. The new year is a great time to reflect and re-evaluate. Perhaps you would like to continue on the path that you are on, or perhaps some changes need to be made. Either way, attending Granlibakken's Restorative Arts and Yoga Festival, May 19-21, 2017, is a great way to rejuvenate yourself for the new year in Lake Tahoe. The Restorative Arts and Yoga Festival is a unique yoga retreat, featuring local Lake Tahoe yoga instructors, an unparalleled setting, and a variety of speakers, instructors, and energy workers. Enjoy some healing and yoga in Tahoe, and see what 6,300 feet can do for your soul. 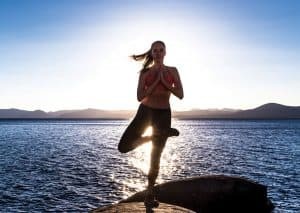 North Lake Tahoe has a vibrant community of healers, yogis, and professionals in alternative healing and eastern modalities, and the Restorative Arts and Yoga retreat capitalizes on this community to bring these local professionals to visitors. Each wellness workshop leader for RAY offers a unique and fresh perspective. Learn a new practice, or grow in areas that you have already dabbled in. This event offers a great opportunity to grow and reflect upon yourself physically, mentally, and spiritually. Granlibakken's setting in a peaceful wooded valley offers the perfect backdrop for a reflective and productive Lake Tahoe yoga and wellness retreat. Start your day with sun salutations, and then choose from a variety of workshops, from sound healing and meditation, to hula hooping or Ki Gong. Meals are provided onsite, and lodging is available. Granlibakken Tahoe is offering an additional 20% off of lodging if you book prior to January 31, 2017 to sweeten the deal. Don't delay, and make your resolution to enjoy some well-being in 2017. Can't make it to RAY 2017? Wellness Weekend, November 11-12, 2017, is also going to be a great event featuring workshop leaders with fresh ideas and perspectives. Offering a fusion of Western and Eastern modalities, speakers, and activity workshops, Wellness Weekend is the perfect opportunity to take a weekend for some self-love and friendship before the holidays and the winter season. We hope to see you at one of our health and wellness events in 2017, and we hope that your year brings healing, friendship, and happiness. Click here for more information about 2017 wellness retreats. This entry was posted in News & Updates, Recreation, Sierra Soul, Uncategorized. Bookmark the permalink.